Even in Minnesota's sub-zero temperatures my greenhouse saved money instead of becoming an expensive hobby! 1. All the vegie and bedding plants that I needed for my gardens. 2. Salad greens and strawberries through all but a few weeks of the winter. 3. Supplemental heat for my home which resulted in a 30% reduction in my heating costs for the season (based on comparisons of heating bills with my neighbors). I'll be the first to admit that my greenhouse wasn't the most beautiful structure in the world, but I still found a lot of enjoyment and function in it. These two shots are of the sloping roof of the greenhouse. The seams that you see in the shots is because each is actually two pics placed side by side. I wanted to show it both with the night cover on and off. 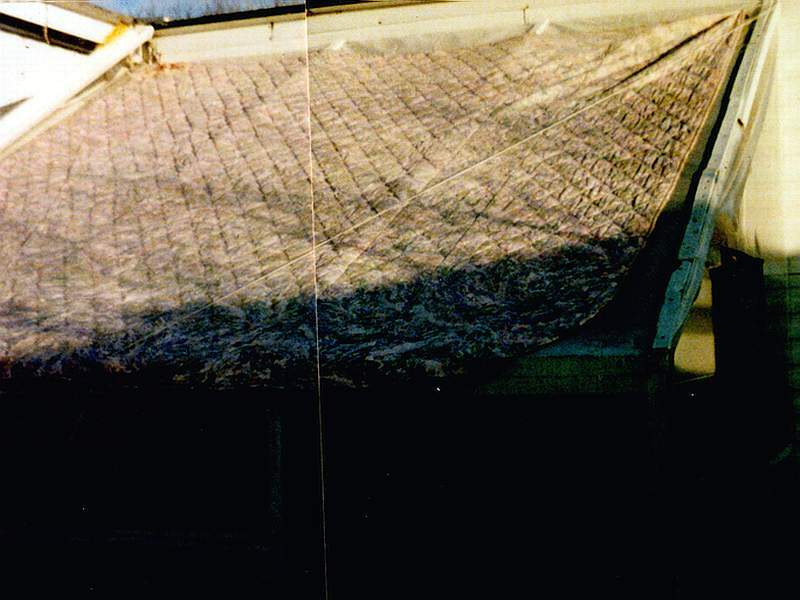 The cover was nothing more than a queen sized quilted bed spread that was pulled up with rope and a couple of pulleys. It served the purpose and cost only $10 to buy at a used furniture store. The cover was pulled up as soon as the sun was low enough in the sky to no longer produce enough light for heat or photo-synthesis and was taking off as soon as the sun was up in the morning. On cloudy/snowing days it was left on. The snow actually shook off nicely. Two shots of the barrels that I used for thermal storage. 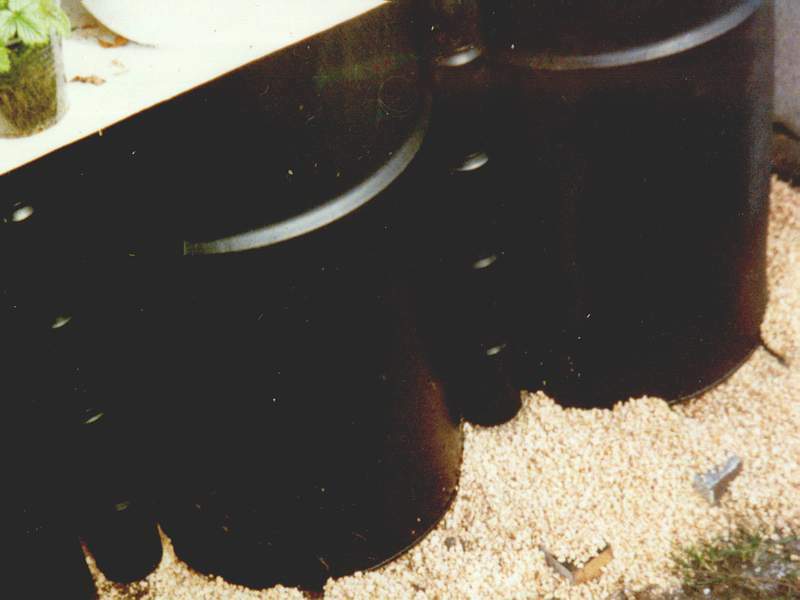 Thirty-gallon drums that were filled with water and painted a flat black. Shelving was put on top of them to use for the plants and to hold back some of the heat. My goal was to keep the greenhouse at as constant a temperature as possible and this way the heat was dissipated a bit more slowly allowing for a more even temperature over a twenty-four hour period. I used pop cans where the barrels touched to pick up just a bit more solar heat and ground corn cob on the ground kept my shoes a bit drier and bounced the light back up for the plants. I'll be adding more pics as I plug away at this project, but I wanted to share this one with you yet. It shows some of the Flowering Maples that I was training as standards. 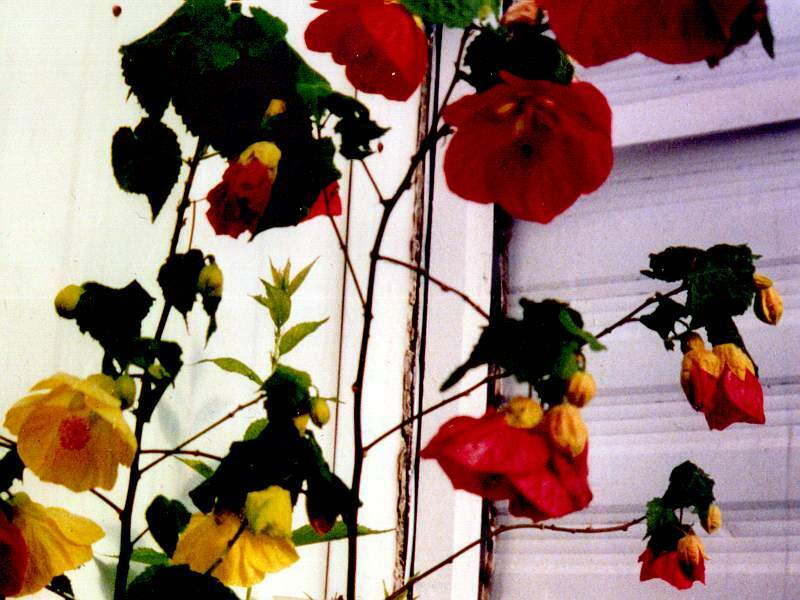 As you can see, even in the middle of winter, they kept blooming like crazy. They loved the greenhouse. Remember, this was in Minnesota, in Mid January, in an UNheated greenhouse! I was fortunate enough to come upon a quantity of aged cedar from a home that was having the deck replaced. During my garden research I'd run across a lot of information concerning greenhouses. Which led to my going on to solar greenhouses... and so when the offer of free lumber was made it didn't take much thought to know that not only would I take it, I already had a use for it. It took about a week lay out a design that would fit the location and the available space and make the best use of the materials that I had available to me. I was able to obtain most of the materials at no cost by recycling the cast offs of others. Some old storm windows became the short south wall, the built-in screens allowed an easy air intake for warm weather climate control. Some old metal barrels, scrubbed up and painted became my thermal storage. Old shelving and paneling and scrap lumber became the shelving. I built it myself.. and considering I had absolutely no experience - I was pretty proud of it when it was completed. The trickiest part was the Dutch door. I decided that it would be nice to be able to open the top half of the door on nice days when I was working inside, leaving the bottom half of the door closed to block out the drafts... Maybe I don't quite understand all of the physics of it.. but it worked. With most of the materials recycled and not costing a cent. I only needed to buy hardware, paint and the plastic covering. So, for less than $100 I had a 10 X 8 greenhouse! The first year I set up a space heater, just to make sure that it didn't freeze out. Minnesota winters can get to 10 and 20 below zero. All the experts were telling me that it couldn't be done here. ... and my little test glass of water never freezing. I didn't worry about it anymore. The next three winters I still had my little glass of water to watch for freezing but I never did bother to put that space heater out again. 1. Provided enough thermal energy to maintain itself without any input from me as far as heat supplementation. 2. The excess heat produced during the day was drawn into my home by using a fan with a thermostat set to start when the temperature in the peak of the greenhouse reached about 80 degrees. 3. By making use of the free heat - heating costs for the home dropped by approximately 30 percent over the heating season. 5. My last winter there I started experimenting with the cold greenhouse varieties of cucumber and tomato. Results were pretty good. 6. 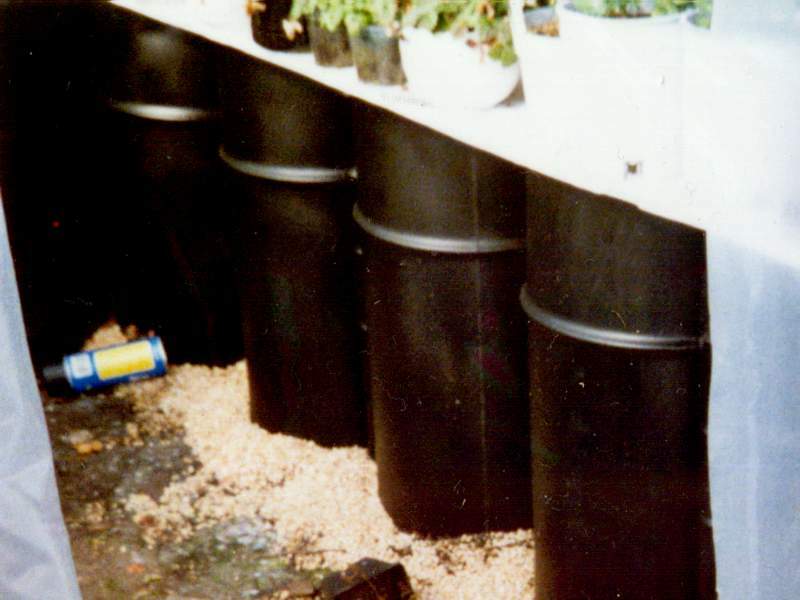 It also produced vegetable and bedding plants enough for my own use with enough extra to be able to sell or trade for supplies; replacement soils, soil amendments, plastic covering (changed annually), paint and replacement hardware. 7. 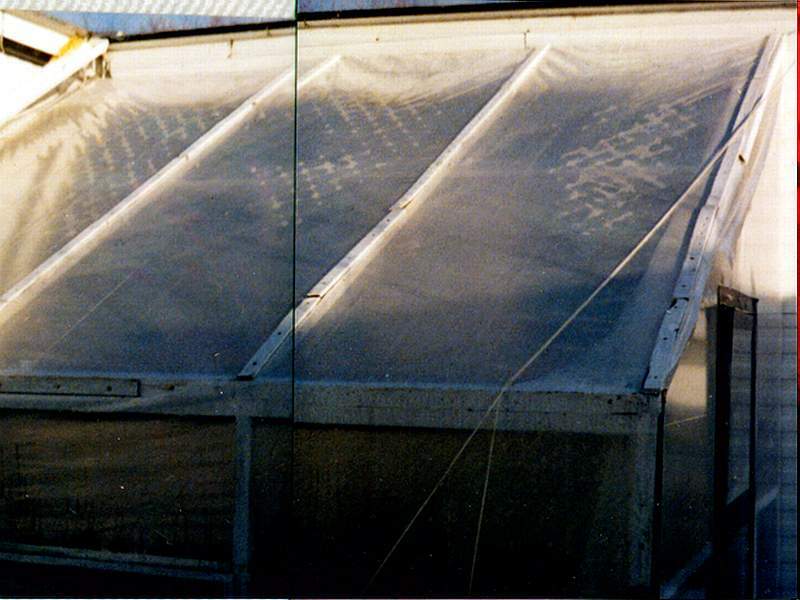 By using thermal storage techniques the greenhouse was able to maintain a more constant temperature, on it's own. The heat picked up during the day was absorbed by the water used as thermal storage and was vented into the home. At night heat was given off by the water barrels to keep the greenhouse warmer, without having to pay for any type of heat supplementation. So, in essence, except for my labor, which was very enjoyable to me, the greenhouse not only paid for itself it greatly reduced my energy bills and provided most of my vegies. I lost that little greenhouse when I lost my home. But, with luck, I'll have another one someday, maybe even a bigger one.